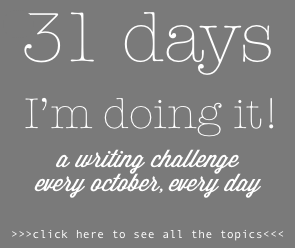 This entry was posted on Sunday, October 11th, 2015 at 2:40 pm	and tagged with gratitude, Thanksgiving, Write31Days and posted in 31 Days Challenge. You can follow any responses to this entry through the RSS 2.0 feed. I am Thankful for you Christie and Glen and your family …. for opening your hearts and sharing your ups and downs and all the in-betweens …. for sharing your children with me 5 days a week so I have the joy of watching them grow and learn. For sharing your tips for coping through challenging times that have helped me more than you can know. You have helped me be thankful and appreciate my family and my daughter and the special friends in my life even more. Thank you for being you! gratitude – often overlooked. when we express it, it becomes a gift to us too – for it has an unexpected yet inevitable way of turning despair into hope… thanks for sharing. Thanks for sharing, Christie. Your thanksgiving message is both challenging and encouraging, and a reminder of what is really important. There was a time when I used to envy people who seemed to have easy lives with no stresses or challenges. Over the years I have come to realize a few things; 1. Some people have private battles that we know nothing about, 2. People who seemed to have it easy have more difficulty being thankful, 3. Going through difficult times teaches us things and helps us to gain new perspectives, so in some ways, it is a gift (although it sure does not feel like it at the time! ).